Companies often use this strategy to standardize rental periods and simplify rental calculations. While billing for actual monthly durations can be more accurate, it also means a lot more work! Whatever your pricing strategy may be, you can easily implement it across EZRentOut. The period of time you delineate as a month will then be used across the system for all sorts of calculations. 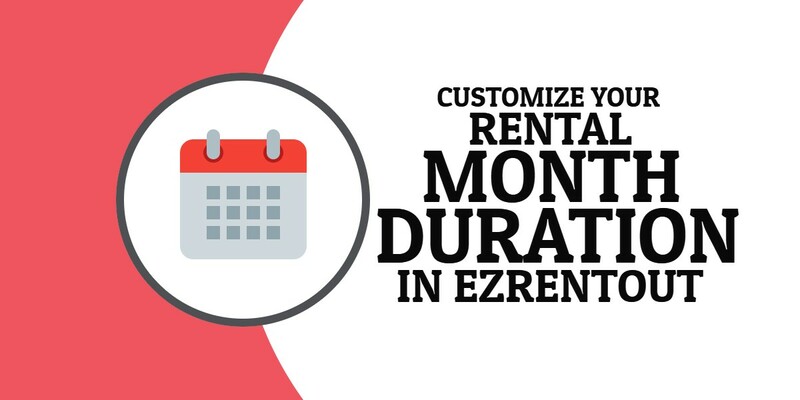 To configure the rental month duration in EZRentOut, go to Settings → Company Settings → Policy → Order Month Duration. Choose the Number of Days in a Month option, make your selection, and save your settings. The ‘Variable’ option picks the actual calendar month each time, meaning January would be a 31-day month, February a 28-day month, etc. This option is enabled by default. What about the other options? They consider all months to be of a fixed and equal length. As an example, say we set the rental month duration to 28 days. Any aspect of the system affected by months – such as Order Duration, Advanced Rental Rates, Late Fees, etc. – will be adjusted to have 28-day months. Let’s see how this affects different aspects of EZRentOut. Please note that these examples are laid out with Inclusive Pricing enabled. With the ‘Variable’ Order Month Duration in place, a month-long order would conclude on the same date of the next month. In this example, you can see if you rent out an asset on the 1st of January, a month will have elapsed on the 1st of February. An Order that starts on the 1st of January and has a duration of one month will end on a different date if the Order Duration is set to ’28 Days’. Notice how the Expected Return Date has changed to 29th January. This is because the software now considers 28-days as one month. Even though the Return Dates were different for both the settings, the payable amount stayed the same. This is because the rental lasted a month in both cases, and the item had monthly pricing associated with it. Between 0 – 2 months at $5.00 per month. Please note that in the examples below, we’ve enabled the stacking of pricing brackets and Exclusive Pricing. We set the duration to 3 months, starting April 1st. Notice the Expected Return Date is July 1st. The Expected Return Date comes out to be different for the same start date and duration. In the 28-day month cycle, 3 months elapse earlier than when they would actually elapse during normal calendar months. The bill comes out to be the same for both settings even though the Expected Return Dates were different. The first two months are billed at $5, and the last month is billed at $10, resulting in a total of $20. Order Month Duration also affects Recurring Orders, which allow you to schedule monthly or weekly billing. For this example, we set the complete duration of this Recurring Order to 3 months, with billing set to every month. Under the ‘Variable’ setting, 3 months amounts to 3 calendar months. Therefore, you will be collecting 3 payments, one for each calendar month. In this recurrence, payment is collected every 28 days. The Order will, therefore, have a shorter lifespan, ending in late January rather than in February. Of course, there will continue to be 3 occurrences – one for each of the three ’28 day’ periods. The Order was rented out on the 1st of January, with the duration set to a month. The rented out asset was due to be returned on the 1st of February but was returned a day late, that is, on the 2nd of February. For the same Order Duration, the asset was due on the 28th of January but was returned later, on the 2nd of February. The disparity between the Expected Return Date and the actual Return Date means that Late Fee is now applicable (if a late fee is set for the concerned asset). Although both orders started on the 1st of January, had a month-long duration, and were returned on the 2nd of February, the applicable Late Fee will be different for both the settings. Below, you can see the Late Fee for the ‘Variable’ setting. Only $10 dollars are charged for the extra day the rental was kept. As with the other features discussed above, changing the Order Month Duration from ‘Variable’ to another option will affect the Best Pricing setting. All the above features for Rental Month Duration also apply to the Webstore. Customers can see that their Expected Return Dates are calculated according to the company’s predefined Rental Month Duration. Depending on your workflow, Amounts Payable could turn out to be very different under ‘Variable’ and ’28 day’ durations. If you tend to pick the Start Date and Duration for your Orders, the amount payable would not change as it is related to the Duration itself. However, if you tend to pick the Start Date and End Date, the Duration itself will change, causing the amount payable to change as well. For example, renting out an Order from the 1st of January to the 1st of February would be one month under the ‘Variable’ setting’, but more than one month under the ’28 Day’ setting. It will, therefore, be priced accordingly. And that’s all you need to know about configuring Order Date Months in EZRentOut!